Let’s get this out of the way right at the top: yes, elements of The Blacklist are very much like The Silence of the Lambs. A sought-after criminal gives himself up, only to team up with a new female FBI agent in the D.C. area to solve crimes that he may or may not be related to. The criminal, Raymond “Red” Reddington, played by James Spader, wants to know what he can about his new “partner” Elizabeth (Megan Boone) in return for the information he has that always seems a step ahead of the FBI. On paper, it looks like all you really need to do is replace the names with Hannibal Lecter and Clarice Starling and you’ve got NBC’s newest show figured out. But here’s where things differ. The Silence of the Lambs was successful because it kept its audience one step behind with Clarice at all times. The problem with The Blacklist though is that it thinks it’s doing that, when it’s exactly the opposite. The pilot for The Blacklist throws in story points that should play like surprises, but instead the viewer can see the twists coming. Reddington was once a promising up-and-comer in the military, who then abandoned his family to sell information to whatever criminal was the highest bidder. After a little over two decades, Reddington walks into FBI headquarters and surrenders, stating he has information about the kidnapping of a general’s daughter, but he’ll only talk to Elizabeth Keen. No one knows who Keen is since this all happens on her first day. Right after Keen reassures her husband that the job won’t get in the middle of them starting their own family, she is bombarded by FBI cars and helicopters. Clearly she jinxed herself. By lunch, she’s missed her adoption meeting (who plans such an important meeting in the middle of the day on your first day at work?). By the end of the day, the first criminal-of-the-week has tortured her husband in their dining room, leaving her to clean her hubby’s bloodstains out of the carpet. Yeah, it’s not a good first day. Reddington warns the FBI of a criminal named Zamani, and with Reddington’s help by him basically telling them everything they need to know to catch him, DC is saved from a chemical attack. Reddington lets it slip that maybe Keen doesn’t know everything about her husband, which she discovers is true after finding a box full of thousands of dollars, a gun and several passports. Nice coincidence. 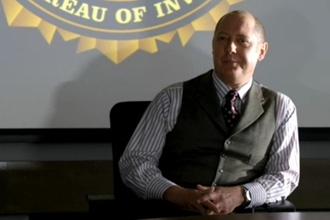 Reddington also lets the FBI know that this was just the first of many criminals that they don’t even know exist. He’s been putting together a list—oh, let’s call it The Blacklist—and is willing to help them find these unknown criminals, as long as he gets to work only with Keen. Spader is a pretty good choice as Reddington, since he can play the enigmatic part well, yet it doesn’t have the pervy element that Spader is known for—I suspect because it seems pretty clear that Reddington is Keen’s father from almost the very beginning. Boone is equally well-suited to Keen, who does pull off that balance of being in control while realizing that she as far from in control as possible. It also is very obvious that The Blacklist will follow the typical TV mystery-drama formula of a new question each episode, while slowly unraveling the deeper mystery between the show’s stars. But even with the first episode, it’s pretty clear what the answer to the big mystery is, yet the show and its characters are just enjoyable enough to stick with it for a bit longer to see what its ultimate goal is. Maybe the show is setting up these pieces to mess with the audience, only to have the rug pulled out from them with a real twist, but if the The Blacklist’s pilot is any indication, it doesn’t really have that level of foresight to pull that off.